Sometimes you find a magic place you didn´t know excited. A couple of weeks ago my partner took me and the kids to such a place. It´s really near where we live, and I had been around there not knowing this magic place excised. The light was just magic as well that day. It has been a long time since I these kind of pictures! I love the combination of the new 7gypsies papers (you find it here) together with papers from 7 Dot´s Studio and Indigoblu (you find it here) . The laze background stamp from Indigoblu is so nice I think (new one - think it will be released in January)! The chipboard branch was painted with Tattered Angels Glimmer Glam. On the background - Tattered Angels Glimmer Mists. 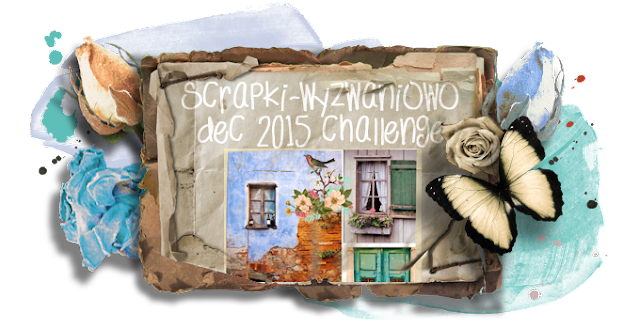 This photo is perfect for the current challenge at Scrapki-Wyzwaniowo. Products from 7gypsies, Indigoblu, Tattered Angels, 7 Dot´s Studio, Prima Marketing, 13@rts, Creative Embellishments. Again a beautiful layout Marie , love how the window became the center point . Thanks for playing with us at Scrapki-Wyzwaniowo !